#stampinup #faithfulinkspirations Today's card is a quick and easy birthday card--but just because it's quick and easy, doesn't mean there isn't a lot of sweet detail to it. 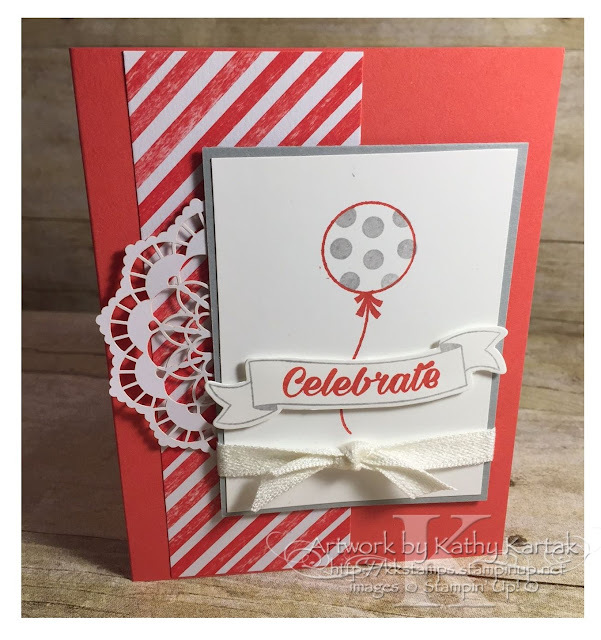 I stamped the balloon outline from the "Birthday Bright" stamp set in Watermelon Wonder onto a 2-3/4" by 3-3/4" Whisper White panel. I filled in the balloon with Smoky Slate polka dots from the same set. I adhered this panel onto a 2-7/8" by 3-7/8" piece of Smoky Slate Card Stock. Next, I stamped the banner in Smoky Slate onto a Whisper White scrap and "celebrate" in Watermelon Wonder. I cut out this banner with one of the Bunch of Banners Framelits and adhered it to the stamped panel with Stampin' Dimensionals. I tied a length of Whisper White ribbon from the So Succulent Ribbon Combo Pack around the panel and set it aside. I adhered a 2" x 5-1/4" strip of Tasty Treats Specialty Designer Series Paper to a Watermelon Wonder Card Stock card base. Then, I adhered half a Lace Doily to the card, and finally, the stamped panel. See? I told you: it might be quick and easy, but this card has a lot of sweet detail!